Get ready for the summer dream! Have your summer to the fullest. Have prepare the firepit yet? You’ll have lots of fun with the fire: cooking, grilling, or just enjoy the warm and the crackling sound of the blazing fire. These list are about the coolest firepits. Not only cool, they’re easy to build as well. So, if you’re in need of the coolest DIY firepit ideas for your garden, enjoy it. So, you’re in need of a new firepit but still undecided to find the right design? Try this Stone firepit. A stone firepit is suitable for any kind of your home style. No matter your home is vintage, modern, classic, this firepit will do well. And you can build it your self –it’s easy. The materials are abundant and cheap: stone bricks, cement (or heavy duty glue). Find your nicest spot, draw a layout, and get your firepit done-just like the example. This firepit is a simplified version of the half-walled firepit. But, this time you won’t need any wall –half or full. The building process is of the same style as well. So, if you want to build one, it won’t be any problem anymore. Just find a good location, draw the pattern (round pattern), start build it. It won’t eat up much of your time. Its fun, the result is great as well. Don’t want to be bothered with some ‘chore’ job of stacking the bricks? Try this concrete firepit. Not the plain drum-like firepit, but you’ll have a ring-like firepit. You’ll need two concrete rings, big and small. Put the small inside the big one concentrically. Fill the empty space between the two with pebbles or stones for the artistic touches and to strengthen them. Now you have a neat ring-like concrete firepit –and the cost is only about $50. You have many sources of awesome DIY firepit ideas for your garden. For example, you can turn the drum of your broken washing machine into an artistic firepit. As you can see from the picture, you only need a few modifications to turn it into a handy firepit. It’s so light and sturdy. And it’s your portable firepit that you can put almost anywhere, on any occasions. You need only around $60 to build this firepit. This cost’s mostly for buying the material: concrete blocks. Find a packet of blocks which, by default, has circular pattern just like the pictured example. Now, after you make the pattern, stack them into two or three-tier concrete blocks. Be sure to secure the block. Pun in sand into the pit, and your firepit is ready to blaze your summer days. You see that the cube firepit in the picture look so awesome and professional. It also lends a classy and elegant air into your house. And, believe or not, it’s easy to build. Just like any other awesome DIY firepit ideas in this list, you need only draw the pattern and find the suitable material. In this case, you need only concrete mixture and its mold –see the steps. Place the coal tray into the middle, pour gravel all around it –and your firepit is ready. For some, may be including you, having to stand or sit on the grass around the firepit is not a cozy way to enjoy the fire. For you, this firepit is packaged with the benches. As you can see here, the round firepit is surrounded by artistic benches. They’re not only a makeshift benches. The arrangements and the materials are so well blended with the firepit. The result is an irresistible firepit and benches. You’ve the tips of building a cube firepit with concrete previously. Now you can improve it a bit by making the firepit using concrete blocks. You need only the blocks and the cement. After finding the right spot and laying the layout, start to build. The effective height is about three-tiers, so set your goal to the tiers. Finish it with natural laying natural stone on the brim. Put the sand in the pit, and your firepit is ready. You want to build a fireplace, but you only have limited spare space for the purpose. Use one of this DIY firepits ideas. A firepit with back will serve well for small space. The back will be the cover and also shielding your wall from the direct fire and the smoke. In this example, you see a round firepit with part of its brim’s heightened to make the back. As you can see, the design is simple yet beautiful. And it’s also potent to shield the wall from the fire. Want one of super easy DIY firepit ideas? Gather stones, and stack them into a fireplace. No, it’s not a joke. This particularly effective if you want to build a temporary firepit. You need only similar size stones for this purpose. Dig a hole and the lay the stones around the hole. Stack them into a big ring of stones. See? Your firepit is ready for the first fire –and your first great day. Regular bricks also serve well for a firepit. This step-by-step pictures show you how. First you make the layout of the firepit on the ground –with the bricks. Then, after you satisfy with it, and know the diameter size, dig a hole (with the size). Arrange back the bricks in the hole and cement it. Now you have a charming bricks firepit. Still remember with the washing machine drum firepit? Another unused object that’ll be great for your firepit is car wheel. So, take out your rusty wheel and make it into a good firepit. The wheel serves as coal/charcoal tray. As the outer lining, find concrete stones and stack them around it –just like the images. Now you’ve recycled the wheel and had an awesome firepit. Along this list of DIY firepits ideas, you’ve see a dozen of different firepits –but all almost in monochromatic colors. So, here you have the more colorful alternative. Find concrete blocks of identical size (but with different colors), gravels, and firepit tray and don’t forget the grill. Find the suitable place for pit and stack the blocks like the picture. Fill the space between the inner and outer blocks with gravels. Now you’re ready to throw a mini barbeque party with the pit. With only around $75 you can have a minimalist firepit. For this one of most awesome DIY firepits ideas, you only need concrete slabs (that’s where almost all the money goes): concrete blocks and concrete slates. No cement’s needed. Stacks the concretes according to the picture. It’s just like playing Lego, easy and fun. But this time you’ll have a nice firepit. After all the concrete and metal firepits, you probably need something calming and mind-balancing. Yes, this firepit will serve you well: a Zen mini firepit. You can even put the firepit on the table. The design is so simplistic, the combination of the pit, smooth pebbles, and glass cover inspires a soothing effects of Eastern serenity. So, if you need a relaxing time this summer, try this Zen mini firepit. It’s awesome for your room and mind. If you want to have the easiest-to-build firepit, this firepit is yours. You need only a shovel, several bricks, pebbles and stone slabs. Find the best place for the firepit, and start dig the firepit. Use the length of the bricks for the depth. Then place the bricks and the stone slabs as in the picture. Put the pebbles inside the pit and enjoy your summer. You probably don’t want to spend too much on building a firepit this summer. Therefore, consider to build this one. For this one of DIY firepits ideas, it only cost you around $40. The materials are easily searchable: fire resistant cinder blocks and mortar. You don’t have to be an expert mason to build this firepit. It’s also easy to build. Just see the example for the layout and the construction. Concrete blocks are versatile building materials. With the right shapes, you almost can build anything you can imagine (of course, if it still related to the building stuff). This one is the example: you can build a neat ring with a stack of concrete slabs. The procedures are just the same: set the firepit layout on the ground, and then trace it with the slabs. The picture presents you a perfect example of the firepit. This one of DIY firepits ideas is an exception: this firepit is big and suitable for a big family barbeque party. Though with a plus size, you can easily and quickly build the pit. For this monstrosity, you need cinder blocks (lots of then) and concrete slates for the bases. Follow the pictures for building instructions. But, basically, if you like stacking stuff, you can do the building processes your self –it’s easy. In list no.16 you have read about under-the-ground firepit. This firepit is a variation of it. The difference is the materials around its edge. In the previous example you only find slabs of stones, now you see a combination of stone slabs and pebbles. This gives a light and cheerful air to the firepit –which will boost your mood greatly. This time you won’t do any stacking or cementing jobs. Instead, for this one of DIY firepits ideas you’ll do some sawing and welding, because you’ll build a metal firepit. The design is simple, it’s just an open box. You need only metal slates and deft hand for sawing and welding (or you can ask someone expert to do it). This firepit is especially useful if you have limited space in your garden. It’s portable and easy to clean. If you like minimalist style, you’ll love this firepit. You have made concrete slabs firepits. Now it’s time to move to another material: the stone slabs. And this time you’ll want to put a base under it. The construction approaches are similar to the way you make a concrete firepit. Only this time you probably have to shape the stones according to your design. And you need to build the base for neater and cleaner firepit. This time you will improvise the firepit with base. In previous list of DIY firepits ideas, you have built a pit with plain base. Now you will make the base with a variety of colors, like the example. Not only with colored stones, add pebbles as well. You will have a simple firepit, surrounded by an awesome base. Want to build a firepit quickly? Suppose you and the family want a quick barbeque and you don’t have the necessary griller or pit, then find some hollow cinder blocks and build the pit on the spot. As you can see from the picture, the construction is easy. Just find the safest place in your garden before building it. You’ll have your barbeque party in minutes then. Meet another awesome bricks firepit. This time you’ll have an all-bricks firepit which also serves as griller. Bricks, along with concretes, are easy to construct. As with this firepit, after lay outing the pattern, you can immediately start building it. A three-tier bricks firepit and the matching griller will be sufficient for your summer and grilling need. You’ve made square metal firepit. Now it’s time to improvise by building a round steel firepit. This firepit consists of two round steel plates, the bigger and smaller plates. Put the smaller plate inside the bigger one. Fill the gap between them with stone slabs. After putting in the coal tray, you have a minimalist and charming firepit. 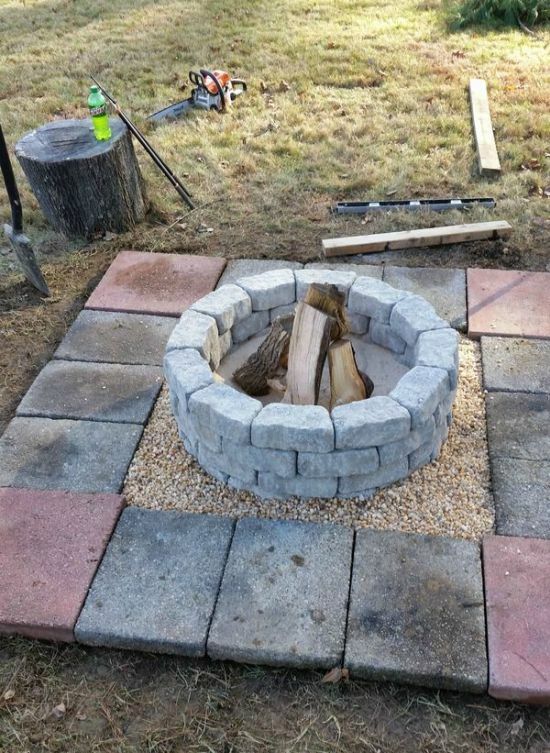 This last DIY firepits ideas is still with cinder blocks. The materials are so multipurpose that they will always pop up when you want to build things. With cinder blocks only, you even can build a fire pit. No cement‘s needed. Just stack the blocks according to your taste or in rectangular shape likes this picture. Put the suitable griller, and you’re ready for a long and happy summer time.